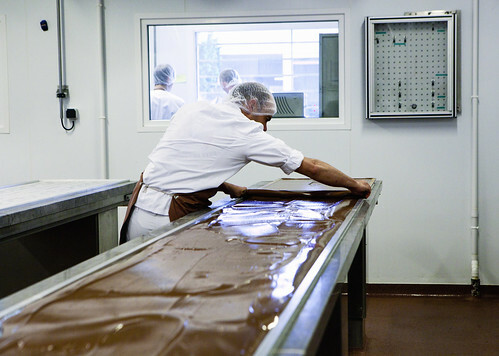 The day I went to La Maison du Chocolat‘s factory in Nanterre, I thought I was Charlie from Dahl’s “Charlie and the Chocolate Factory.” The obvious differences were that I am an adult woman and I will not get a lifetime supply of chocolate (sadly). I would be, however, be bestowed by the presence of La Maison du Chocolat’s Creative Director, Gilles Marchal for pretty much the entire day. Think of it as a fashion equivalent of meeting Chanel’s current head designer/creative director, Karl Lagerfield. Both design their products for their luxury brand, collaborate with the heads of their individual departments (in fashion: accessories, clothes, shoes, etc., collaborate to carry out the company’s vision), and they do create seasonal lines. Getting up bright and early, I waited at my hotel lobby for Gilles, surfing the web getting posted with what’s going on beyond Paris with my iPhone. When it’s about 6:30, a Frenchman dressed in a cropped trench coat, white button down, and jeans, walked in to speak to the concierge looking for me. I got up and we made our formal introductions. He struck me as a calm, very friendly and laid back person. Getting into his car, starting our car ride out to LMDC’s factory in Nanterre, driving through the then-quiet streets of Paris (a rare sight to see) passing through the Manhattan-looking La Défense and soon enough, we’re right in front of the factory. I found out over our duration why Gilles wanted to meet me this early in the morning, he has to go to a photo shoot and French radio show right after our tour but he coordinated a pastry tasting in one of their boutiques in Paris later on the afternoon, which is perfectly fine with me. Before we enter the pastry division of the factory, I had to get dressed in a sheer white lab coat, a hair cap (that looked like surgical scrub hats), and surgical shoe covers (to cover my Jimmy Choo flats); all in the name of food safety and to protect my outside clothing. Gilles changed to his chef’s shirt and donned on a tall chef’s hat. Spiffy. 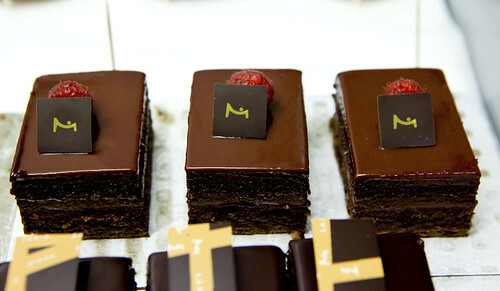 Walk over a few feet down the hall, we have to scrub our hands clean so we don’t contaminate the precious chocolates and pastries. 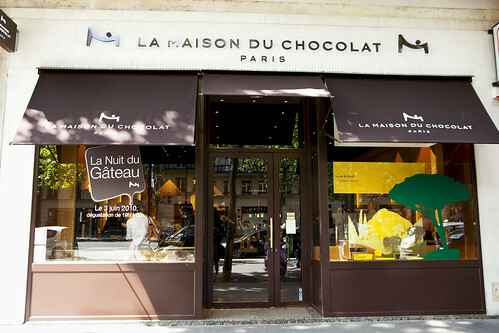 Entering upon the first room where the head chocolatier of La Maison du Chocolat, we both greeted Bonjour and Gilles introduced me to the friendly man in French. 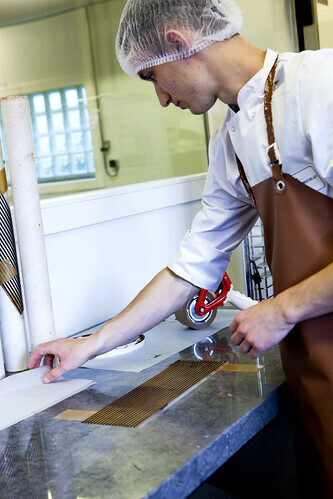 Gilles explained that the chocolatier is making models for the potential chocolate display for Christmas. 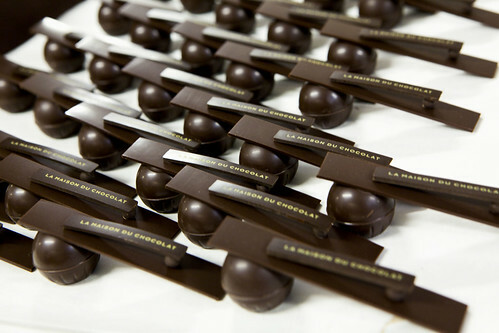 On average, according to Gilles translation, the chocolatier would create about four complete models, show it to the corporate people of LMDC and decide what will be shown. As we walk down through the relatively quiet (the only things I heard were humming of the machines’ motors, sound of running water from the faucet once in a while, and cutting of large bags of sugar, flour, etc.) 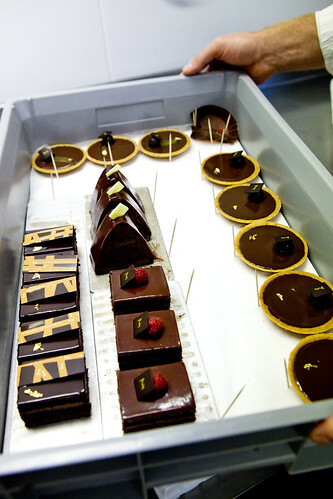 pristine kitchen, meeting other developers and important people that aid in the creation of LMDC’s pastry flavors, we eventually walk into one of the many refrigerated rooms that the employees were quietly packing in the gorgeous pastries, like the one shown above. 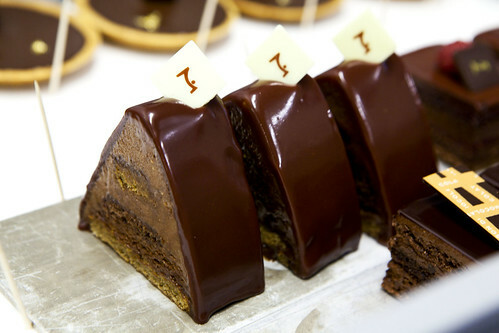 Being in the presence of large flats full of individually sliced cakes and tarts, it was looking at shiny, streamlined chocolate coated jewels. 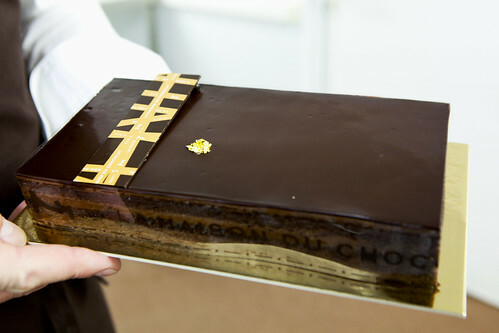 Then Gilles playfully thought out loud and pulled out the large Delice cake. How my eyes and stomach yearned to eat that freshly made cake…and I didn’t have breakfast yet. The temptation was killing me. Moving onto the next round of pastries to grace its presence to my eyes were their full flavor line of eclairs: café (coffee), caramel, and LMDC’s signature, chocolate. 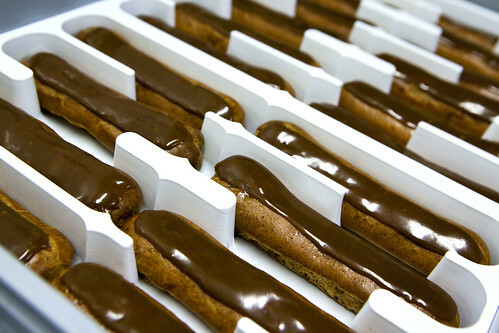 All ready and neatly packed in special plastic eclair holders to prevent it from shuffling around when deliveries are being made in Paris and beyond. Ingenious. Then, Gilles paused a moment and said that he’s going to show me the newest desserts that are just making its debut in Paris: the Bourbon vanilla with wild strawberries and the chocolate mousse. 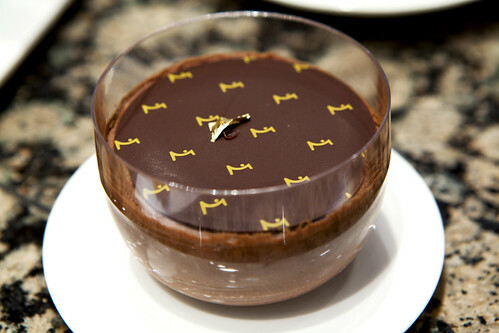 Look at those beauties… The chocolate mousse, Gilles said, was a luxurious/whimsical take on his mother’s recipe. 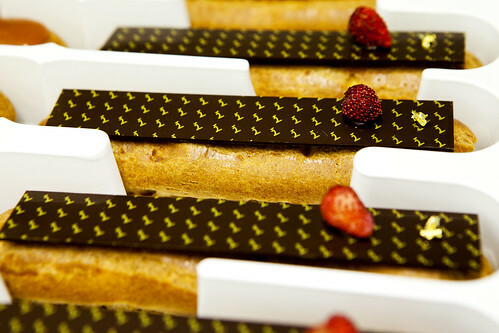 As for the Bourbon vanilla with wild strawberries eclair is seasonally appropriate (late spring to mid to late summer is strawberry season, in case you didn’t know). Gilles said I’ll be getting to try these later on the afternoon when we meet at the boutique. I couldn’t wait. 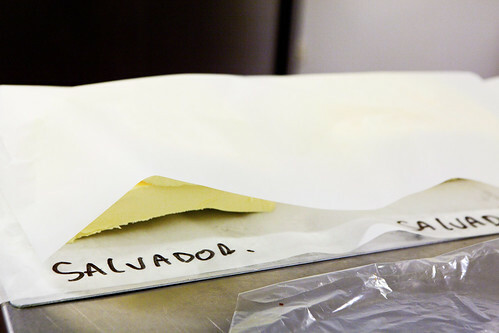 When we moved onto the chocolate side of the factory, they were making the Salvador ganache that particular morning. 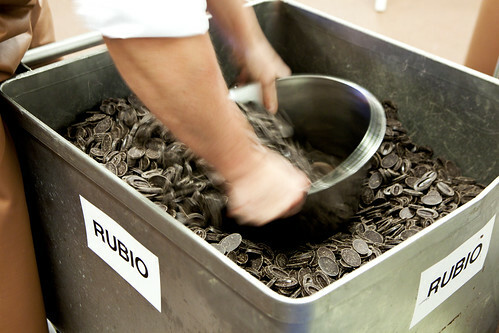 A large pallet of “Rubios” from Valrhona set in the middle of the room, slabs of weighed French butter and gently simmering stock pot full of pure raspberry puree. The scent of warm, tart raspberry lingering in the cool air. The quiet sounds of employees shoveling out Rubios from a large bin and dumping into that huge pot of warm raspberry pulp; stirring it. The patient clatter feels controlled and attentive. 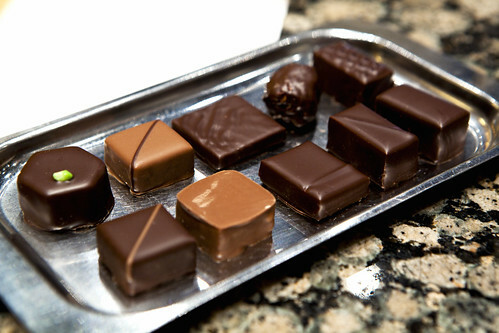 Before we left this chocolatier, Gilles asked him in French about informing when they’re going to form the ganaches. He acknowledged. 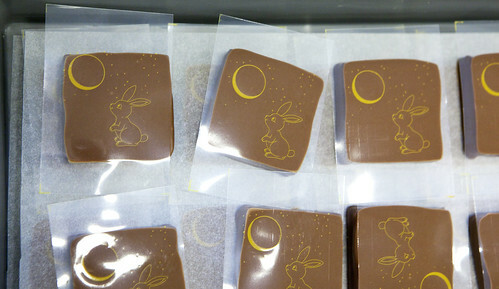 We moved onto a different room, occupied by two different chocolatiers, who are making more chocolate decorations. 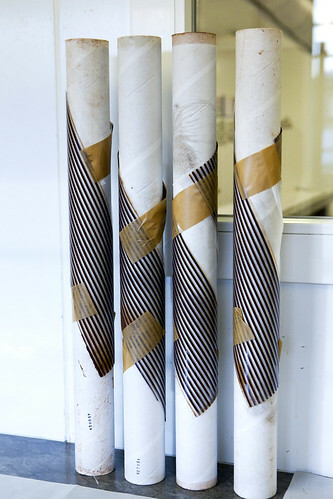 They made shiny molded chocolate balls and currently making long, thin chocolate stripes using sheets of acetate paper, spread a thin layer of tempered chocolate, use a decorating comb to create the lines and set it curled by rolling up the tubes. 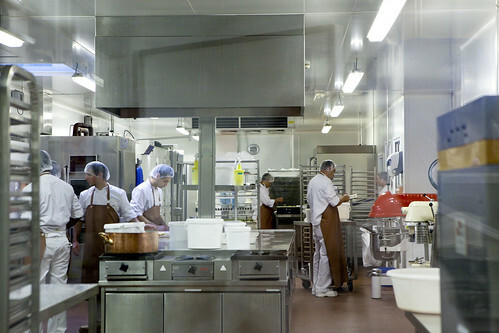 Moving on to the noisiest room of the factory, the ganache chopping room. These three men were wearing bright red ear muffs just to protect their ear drums as they run these hardened ganache slabs through the confectionery guitar cutter, making loud thumping, thundering noises as it gets cut into bite size pieces. 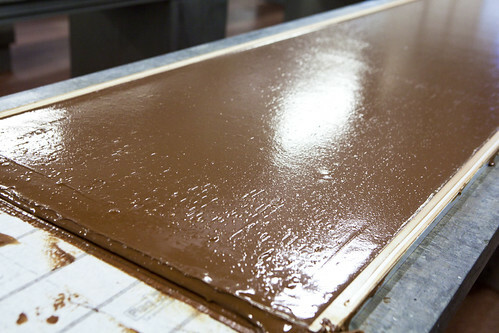 …Chocolate enrobing room. 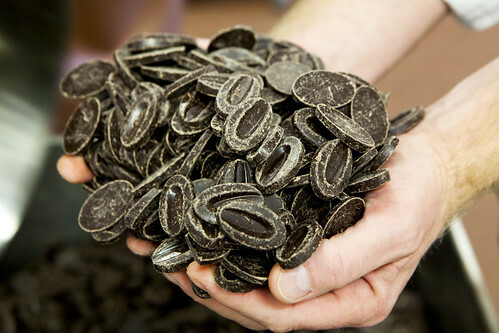 Employees here take the hardened ganaches, line them down the conveyor belt to get its appropriate chocolate coating. One machine does milk chocolate, while the other does the dark chocolate. As you follow the long belt down to the next room, it’s slowly riding down the cooling tunnel. This is the time when I had an “I Love Lucy” moment of stuffing my mouth with chocolates as it rolled past me. There’s also a Christmas(?) 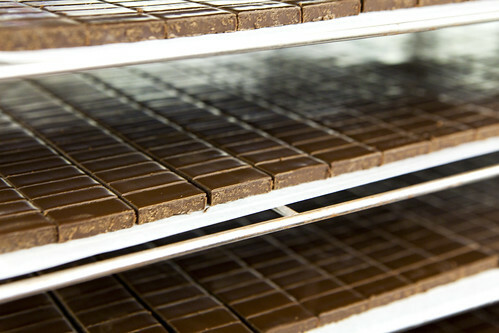 bonbon in production at the same time as the Amèlos. Going along the layout of this factory, toward the end of this side of the chocolate division, we entered the packing room. 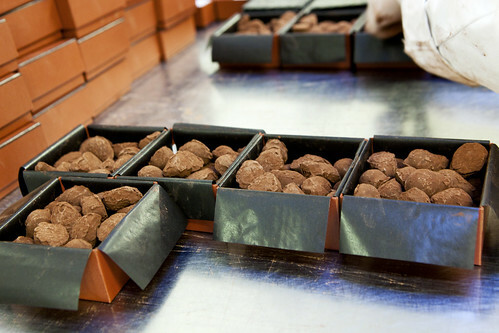 Today, the four ladies, listening to a French radio station out loud (a startling difference compared to the other rooms), were packing Cognac truffles. Gilles harmlessly flirtatious banter with the ladies there and handed me a truffle to taste. Taking this craggy, cocoa dusted truffle, I popped it into my mouth and bit it ever so slightly, releasing the explosive flavors of this chocolate. The smoky, smooth Cognac flavor exploded in my mouth for several seconds then slowly dissipates into the darker, slightly bitter (in a good way) chocolate that is the base of this truffle. The Cognac flavor still lingered in my mouth after I swallowed. 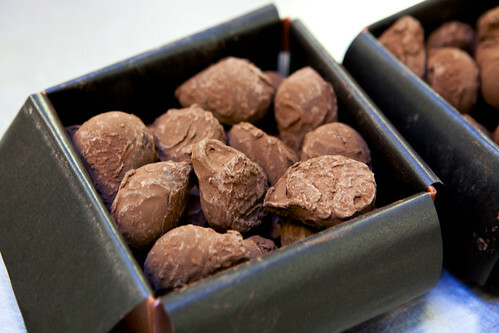 It makes a huge difference of having fresh chocolate versus not-so-fresh chocolate. 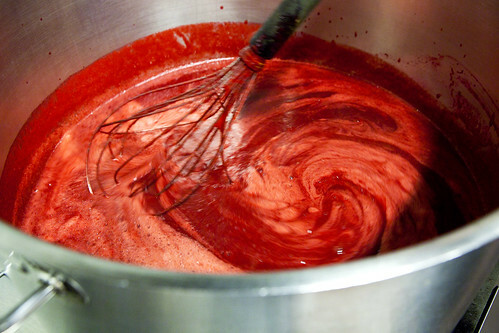 Then one of the employees that Gilles and I saw earlier, called us back to see the ganache pour and forming. It’s relatively self-explanatory as you look at all the photos and video clips I’ve placed above. As I said on the caption, start from the top left then go right and proceed the next rows the same manner. After watching that cool part, that concluded our factory tour. Leaving the exit, I took off the disposable shoe covers, my surgical hair cap and lab coat, as what Gilles said, “Be free” from our restraints. It was surprising to learn, as we’re leaving the vicinity, that there’s only 50 people work in both the chocolate and pastry divisions of this factory. I presume there would be more since this is an international chocolate brand. Going back to his car, heading back to my hotel in Paris, we encountered the typical Parisian traffic jam during rush hour. To kill some time, we had conversations about his worldly travels, opinions about food, and eventually, inquiring me where I ate and where I’m planning to eat for dinner. I told him where I had reservations for that evening and he said he knew the chef. 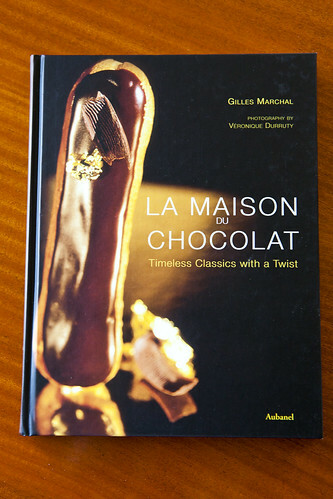 It should not be a revelation since he was a pastry chef of the 2* Michelin restaurant, Le Bristol since 1999 prior to joining La Maison du Chocolat in 2007, he would know his colleagues, as any chef community would. Talking to him about food and travel reveals his passion for food (and chocolates, of course) and he’s very articulate expressing it in English. Dragging HC along Boulevard de la Madeline, I was in the panicked mindset as I didn’t want to be late for this tasting since I know Gilles is a busy man. 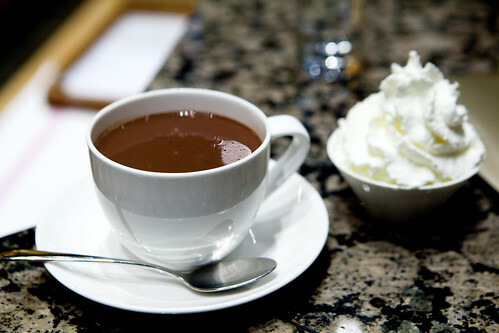 Since we’re early and the employees knew we were coming, they let us have a beverage to pick and end up choosing the signature drink of the house, the Caracas hot chocolate with whipped cream on the side. As I am no stranger to this decadent drink, it’s always rich, creamy, bold and complex with many layers of flavors unraveling on my palate. Personally, I don’t need the whipped cream but HC added a heap in her cup to amplify the richness and well, she loves her whipped cream. 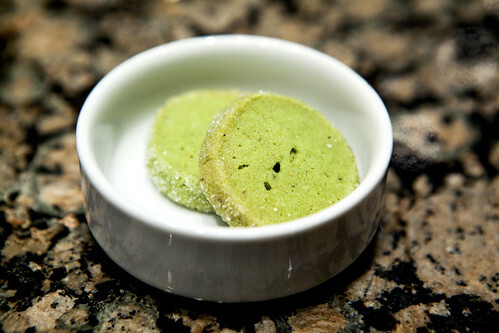 As for the green tea sablés, they were divine. Perfectly crisp and crumbly at the same time with a hint of green tea with a vanilla-butter flavor mingling in the background. 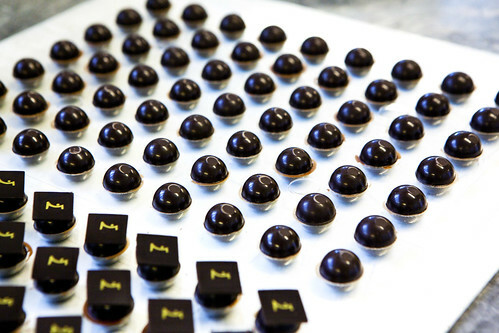 As Gilles entered the boutique, he came in with smiles and did a spontaneous starter of tasting a tray of their signature chocolate bonbons. (Click the photo for flavors.) My personal favorite of the bunch was the Bacchus (a raisin ganache with flambeed rum, enrobed in dark chocolate) and the Rigoletto Noir (caramelize mousse ganache in dark chocolate). Getting to the main event: the pastries. 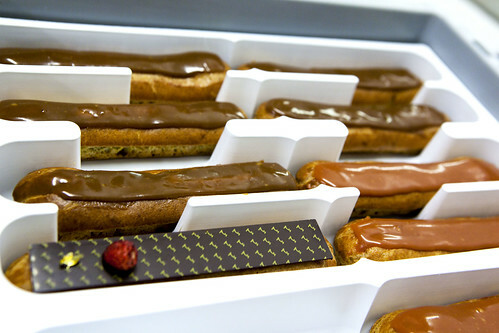 Gilles bestowed us trays of their signature chocolate eclair and the new and highly anticipated (for me, at least) flavor Bourbon vanilla with wild strawberries. 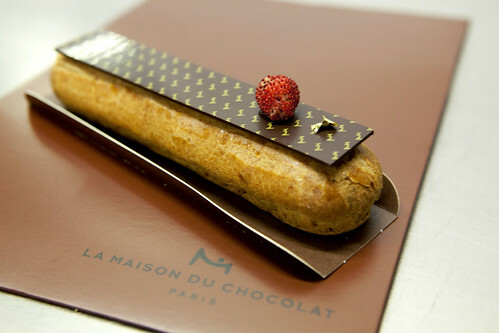 According to Gilles, the Bourbon vanilla eclair will start its debut here in Paris first then over to Tokyo and eventually in a couple of months, New York City. I do feel privileged to get a preview many months ahead. 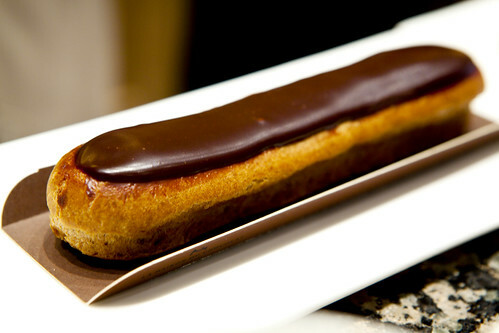 Tasting the chocolate eclair first, as the control group, this was perfectly made. The choux was perfectly baked and caramelized evenly that as I bite, the choux has a certain crispness and not chewy. The chocolate pastry cream was intensely chocolate-y and smooth, while the chocolate glaze added more robust chocolate flavor. 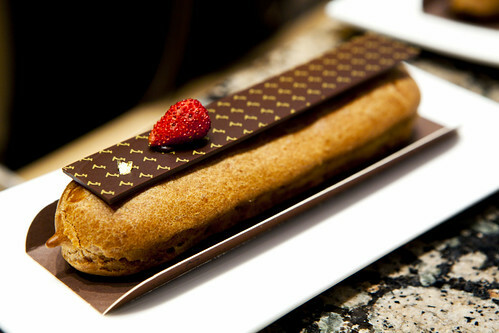 As for the Bourbon vanilla with wild strawberries eclair, it was the antithesis (flavor-wise) of the chocolate. Even though it has the same textbook choux, it tasted lighter. The tiny, sweet wild strawberries added bursts of sweet-barely tart essence, while the Bourbon vanilla flecked pastry cream was a great background to the strawberries. The only bit of chocolate was the slender, metate emblazoned logo (of La Maison du Chocolat), gilded with a flake of gold leaf and wild strawberry. 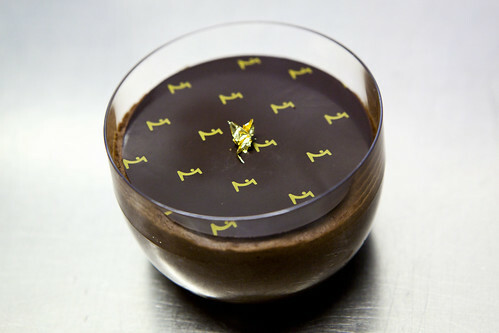 The chocolate mousse was something Gilles was particularly excited about as this is his mother’s recipe. If you read his cookbook , this hold a special place in his heart, as any fond childhood memory would. The difference is that Gilles used the idea of the crème brûlée. The thin, round circle of tempered, metate logo-ed, chocolate acts like the burnt sugar crust of the aforementioned dessert. So, you take a dessert spoon, crack that chocolate shell and spoon it out with the fluffy, deeply chocolate-y and intense chocolate mousse and savor. 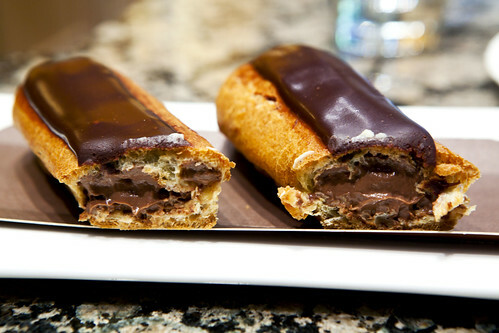 Close your eyes for a moment and let that chocolate cloud tantalize your tastebuds and make you quiver by its intensity. I just had to tell Gilles this was simply amazing. 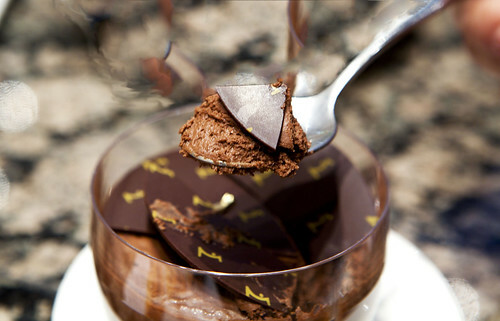 This is for the chocoholic who is craving that deeply rich bite. 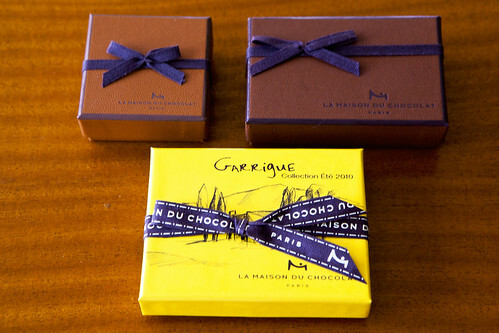 Wrapping up our tasting session, Gilles packed impromptu gift bags for us filled with boxes of bonbons, including the annual summer collection, Garrigue. 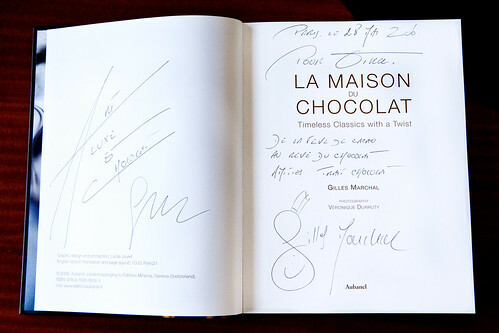 One of the many things I treasure was the cookbook Gilles autographed on the spur of the moment. To sum up what he wrote, it’s about luxury and chocolate dreamer. And finally, this photo to top this amazing day off – a photo of Gilles Marchal and I. Many, many thanks again to La Maison du Chocolat for inviting me to tour their factory in Nanterre, arranging the meeting of the gregarious, generous and amiable Creative Director, Gilles Marchal for both personally escorting me to and from my hotel to Nanterre and having this personal pastry tasting at the Madeline boutique. These were the highlights of my Parisian vacation and probably, my life. 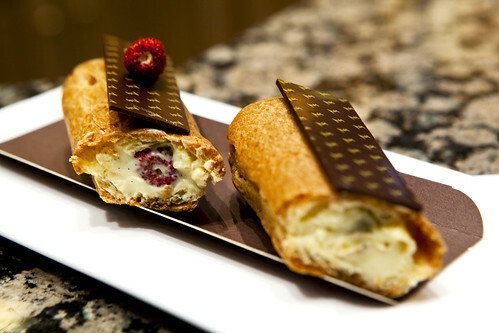 For the complete set of the photos to my pastry tasting visit, see my photoset on Flickr. 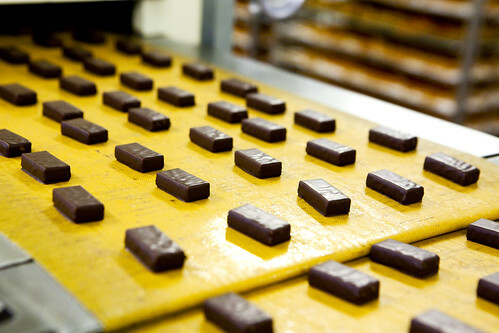 This entire post is pretty incredible to me (given that you had to opportunity to see the workings of a chocolate factory), but the thing that’s most impressive to me is the name tag chocolates haha. Sounds silly, but it seems like such a small detail to address that it feels that much more… grand? I just came across your blog and wanted to say i think it is fabulous. 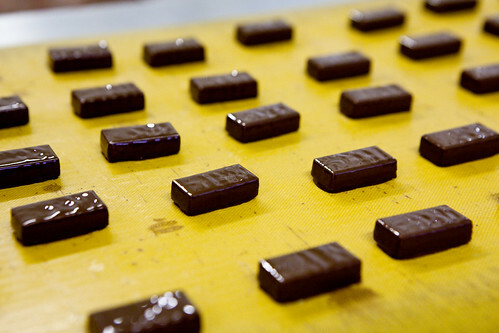 I especially love this post about making chocolate, wish i was there. Keep it up, you have a new follower. FANTASTIC. Great pictures and memories! I want everything. BEST.POST.EVER. Nicholas: Yeah, it’s still surreal to me ’til day. Well, the names on the chocolates is like having logos on a designer bag or clothing (that’s if you buy designer stuff emblazoned with such things).